Déménagement en provenance/direction de Wichita, KS? Les remorques fermées et carrossées de U-Haul sont ingénieusement conçues pour protéger et retenir vos biens précieux, alors que nos remorques ouvertes sont idéales pour tirer des matériaux de construction ou d’aménagement paysager et des articles de gros volume. Les remorques pour voiture de U-Haul sont dotées de rampes à chargement facile pour un chargement sans effort des véhicules, alors que nos remorques pour moto sont légères et faciles à remorquer. Obtenez GRATUITEMENT des estimations de tarif pour la location de remorque à Wichita KS 67209 dès aujourd’hui! Les remorques fermées à Wichita, KS sont légères, aérodynamiques et conçues pour offrir une plus faible consommation de carburant, facilitant le remorquage. Chaque année, des millions de familles utilisent nos remorques carrossées pour déménager. U-Haul offre une vaste sélection de remorques carrossées à louer dans la même ville ou pour un aller simple. Consultez les tailles de nos remorques fermées et réservez en ligne une location de remorque chez Westside Storage! Les remorques ouvertes sont idéales pour le remorquage de charges grosses ou surdimensionnées à Wichita KS 67209. De nombreuses remorques ouvertes sont louées avec une rampe de chargement pour plus de commodité. La sélection de remorques ouvertes offertes chez Westside Storage représente une solution abordable pour des projets d’amélioration résidentielle, la livraison de meubles ou le remorquage de véhicules récréatifs. La location de remorque ouverte est également populaire auprès des entreprises pour la livraison et lors de salons commerciaux. Les remorques ouvertes sont offertes en une variété de dimensions et de styles afin que toutes les voitures puissent les remorquer. This was one of the easier pick ups of a Uhaul that I have had. The staff was very friendly and things went quickly and smoothly. Very friendly and knowledgeable! Went above and beyond!?? Wichita drop off location was tight to wiggle around in to drop off a trailer. The staff was very helpful! Very friendly. The 800 number said they did not offer an after hours return but they actually do which worked out great. I always use this location due to the fact that they are always friendly, efficient and have a pleasant attitude. Very nice place and very nice staff to work with. Love this location! First time renting a Uhual and staff was willing to answer any questions and because it was 17 degrees out they had started warming up my rental before I was even there. Loved it! Westside Storage is by far the best U-Haul and storage location I have ever used. The staff is so courteous and conscientious! Always the best service- they make your move easy. The storage is climate controlled, very secure, and easy to load and unload. We had items in storage from summer to winter and there was zero damage to anything! I cannot say enough about the superior quality of Westside Storage! Being more specific with pricing and charging the right amount. Great customer service!!! I will always rent from there and will recommend them. Appreciated quick efficient service when picking up. Good equipment, fair price. No issues. Great staff. Called and communicated well with me! Great experience from the quote to the return! Nice and easy from the quote to the return. Will use again next time! Great experience! Knowledgeable, friendly, & helpful staff -- great equipment & excellent location (easy entrance & exit)! This is now my go-to U-Haul location! The ladies at this location are great. They were outside before I could even get out of my truck. I parked the trailer exactly where she wanted it and they went to work unhooking it. They were like a NASCAR pit crew, I was unhooked and out of the parking lot in less than 5 minutes.... smoothest process ever. Hire helpful agents who actually at least pretend to care. Old truck with "air ride" that jarred your teeth lose with every small bump was disappointing. 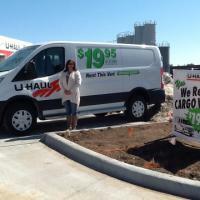 This location should be the "Hub" for U-haul in Wichita. Overall best experience with any U-haul location. 5 Stars!